In Louisiana, many professions that are unlicensed elsewhere require a license. Louisiana is the only state that requires florists to get government permission to arrange flowers, for example. 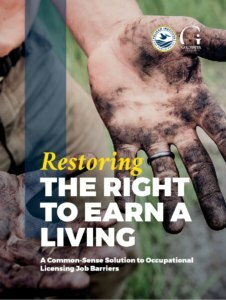 The costs of receiving an occupational license—in money and time commitment—can be prohibitively high as well: In order to receive a license as an alarm installer, licensees must demonstrate more than five years of education and work experience, pass four exams, and pay $1,400 in fees. Many in Louisiana, including Governor John Bel Edwards, have begun to push for occupational licensing reform in the state; Governor Edwards has specifically questioned the florist license. In his paper, Riches points to the Right to Earn a Living Act, already law in Arizona, as a solution. The Act, he explains, would put “the burden of proof back where it belongs—on the regulators who restrict economic freedom, instead of the job-seeker.” If the government cannot prove that a license is required to protect the public, then people are free to pursue the occupation of their choice.